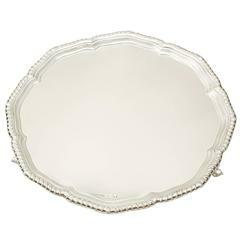 An exceptional, fine and impressive vintage Elizabeth II English sterling silver salver in the George I style; an addition to our silver dining collection This exceptional vintage Elizabeth II English sterling silver salver has a lobed hexafoil shaped form, in the George I style. The surface of this vintage salver is plain and embellished with a contemporary bright cut engraved coat of arms displaying a cross charged with five torteaux and quarterly a thistle to the first, second a cornucopia, third a dragon erased and a stag's head erased to the fourth, all above the motto 'Inter Floris Floream'. The impressive coat of arms is surmounted by a helm and mantling in addition to a crest depicting two lion's gambs erect holding a fountain. 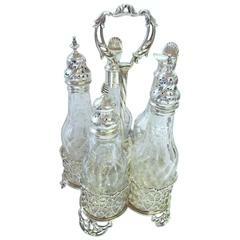 The salver is supported by three impressive and large, George I style tiered bracket feet. 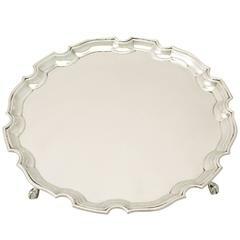 This impressive salver, crafted by the renowned London silversmith Richard Comyns of William Comyns & Sons Ltd, is a highly desirably shape. Condition: This vintage silver salver is an exceptional gauge of silver, exceptional quality and in exceptional presentation condition. The bright cut engraved coat of arms is very crisp. Full hallmarks struck to the underside of the salver are all very clear. Dimensions: Diameter 29.5cm/11.6" Diameter of surface 25.5cm/10" approximately Height 3.3cm/1.3" Weight: 31.7 troy ounces/986g Maker: William Comyns & Sons Ltd (Richard Comyns) Origin: London, England Date: 1969 Video: A video of this fine piece is available upon request. Reflections in photography may detract from the true representation of this impressive Richard Comyns silver item. This vintage silver salver is an exceptional gauge of silver, exceptional quality and in exceptional presentation condition. The bright cut engraved coat of arms is very crisp. 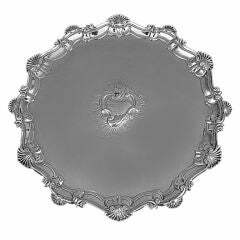 Full hallmarks struck to the underside of the salver are all very clear. 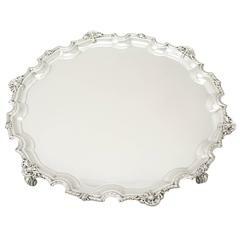 A George II sterling silver salver by Dorothy Sarbit of London with bold shell and C-scroll shaped border, the center with raised crest, on three scrolled feet.